Stay and play at Fairmont Resort Blue Mountains, MGallery by Sofitel play the onsite Leura Golf Course, then enjoy more golfing in the Blue Mountains with a game at both Wentworth Falls and Blackheath Golf Courses. Wentworth Falls Country Club is perfectly located in the heart of the Blue Mountains. It has an exciting and challenging 18 hole golf course with full practice facilities, a teaching professional and a fully stocked Pro Shop. The course is easy walking with only a couple of uphill holes to give your heart an extra pump. Fairways are lined with a mixture of native trees, bushes and exotics. Practice facilities include a 150-metre long fairway and a practice green and bunker for honing the short game. Two driving nets and a large practice green give players a quick warm up option. The course plays 5719 metres and has a rating of 69.2. The course welcomes visitors and social players, with competitions on Tuesday, Thursday and Saturday, open to both men and women with Australian Handicaps. Club Pro Robert Kennedy, and his assistant Trainee Pro Luke O’Carrigan are in demand for lessons from golfers across the Mountains. They also hold group lessons for beginners including special ladies clinics, and run a strong Junior Program where young players are provided with structured learning and playing pathways. Rob placed second at the 2017 PGA Professionals Championship. Carts are available for hire. There is also a comfortable Clubhouse with sweeping views of the golf course, and the facilities include a Bistro, Bar, TAB and Gaming. 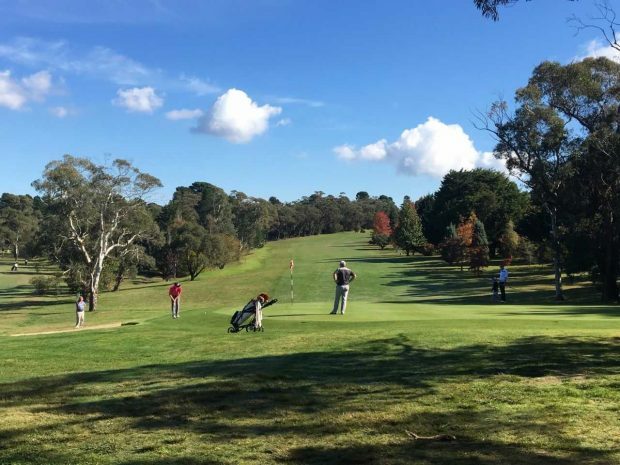 Nestled at the top of the Blue Mountains is the beautiful Blackheath golf course. Boasting 18 holes of magnificent fairways and superb greens, the course is lined with colourful flowering trees and shrubs, including maples, azaleas, blossoms, dogwoods, silver birch and, of course, an abundance of rhododendrons. The course is open to social players seven days a week, subject to availability. Visitors with a GA handicap can also play in Blackheath’s Club competitions which are held on Wednesdays and Saturdays for men, and on Thursdays and Saturdays for ladies. The Blackheath Golf Club changed its name in 2017 to the Blackheath Golf & Community Club and in so doing, now provides more social activities for the non-golfing community. The Clubhouse offers golfing and social members, as well as visitors to the Club, an excellent bistro, a lounge area, a slow combustion fire, free Wi-Fi and live music most Wednesday and Saturday evenings. The well-stocked Pro Shop is managed by the Club’s Professional, Darrin Walden who has the latest golf carts available for hire, as well as buggies and golf clubs.